Suppose your story is at a point where a particular actor must be the leader. There could be any number of reasons why you’re forcing the leader to be that actor: maybe your game has a mechanic where the leader can use a specific skill on the map, and different actors have different skills available. Maybe you just want that actor to be a leader. 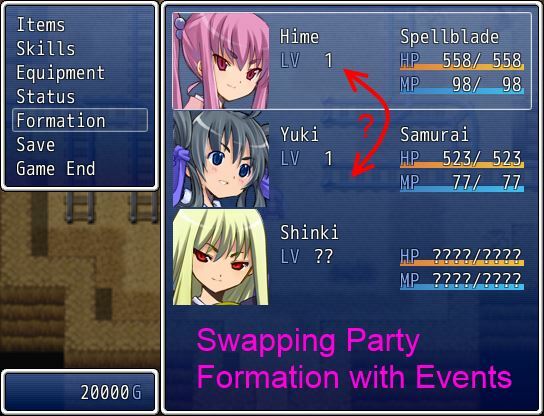 In any case, you want the leader to be a specific actor in the party, so you may need to perform a party formation swap. But how do you do this? But that might be annoying. Alternatively, you can use script calls. Game_Party has a method called swap_order which takes two indices. When you call this method, the actors at the specified indices will be swapped. Which index will we change it with? The leader. The leader is easy: it’s index 0. The less trivial part is to figure out the correct index we want to swap it with. To do this, we will use a method from Game_Actor called index, which returns the index of that actor in the party. Once you make that script call, the party formation will change as you need. What can you do with the swap_order script? I tried doing this in MV, but an error pops up saying “$gameParty not defined”. hello, nice one! what if i want to force the order of the formation with actor 1 being party member 0, actor 2 party member 1, etc? How can I do this with RPG Maker MV? How did you do that. I’ve always wondered how to do that? I used a script to draw ??? ?’s instead of the actual numbers.